Here, the railroad encountered a creek flowing through a valley. Another railroad was later built along one bank of the creek. Along the other side of the creek, a hiking and biking trail gives people a chance to get out and see nature. Of course, at this location, they can also look up and see the passing trains crossing the valley on the bridge. 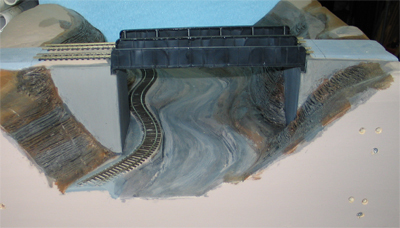 The bridge was made from a kit, but needed some minor modifications to conform to our modular standards. The tracks were originally 2 1/4 inches apart, but the standards call for track centers to be 2 inches apart, so a modification was needed. This type of bridge is called an open-deck plate-girder bridge. "Open deck" means that you can look between the ties and see the creek below; there is no solid floor. "Plate girder" means that the main structural elements are girders made from steel plates. 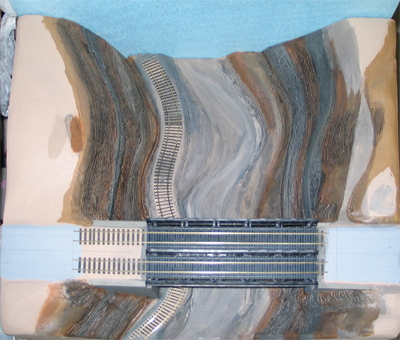 For bridges of this length, this is a very common type of bridge. 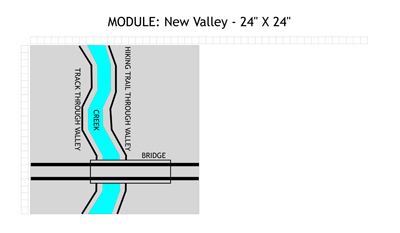 New Valley module, seen from above. New Valley module, seen from the front.